We have four new presidential approval polls out this week that suggest a slowing of the recent upturn in President Bush's job ratings. The new data are a Pew Research poll done 9/12-16/07 with approval at 31%, disapproval at 59%, A CBS News poll done 9/14-16/07 with approval at 29%, disapproval at 64%, Zogby/Reuters conducted 9/13-16/07 found approval at 29% and disapproval at 71% and the Gallup/USAToday poll taken 9/14-16/07 which put approval at 36% and disapproval at 62%. The result of these three new readings at the low end and one at the high end of recent polling moves the trend estimate to 32.5%. The blue trend line is still showing an upturn but the rate of increase now looks less steep. 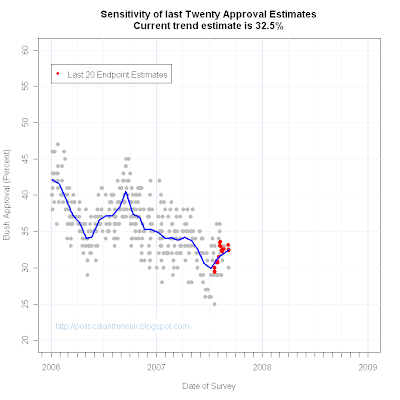 In comparison, the more sensitive red line estimator thinks approval has leveled off and is no longer climbing. 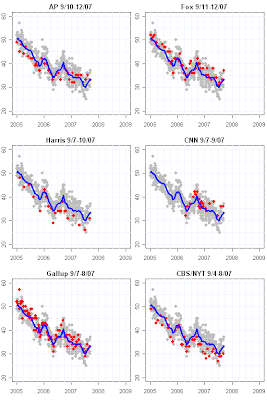 However, red and blue estimates are in close agreement so we need more data to be confident about the leveling off. The situation is further complicated by the fact that three of the recent polls are from organizations whose polls typically have a negative house effect, meaning they tend to run a bit below the trend line. Gallup is the exception which is usually a bit above trend. The accident that 3 of the 4 new polls happen to come from houses with negative effects may mean we are overstating the amount of flattening in approval. This should become clear with a few more polls next week. At the moment we've seen quite a range of recent polls, with Zogby at CBS down at 29% while Gallup at 36% and Fox at 37% represent the high end. Still, this range of variation is about what we've come to expect and none of the recent polls is outside the 95% confidence intervals. So while politically there is a big difference between 29% and 37%, both are quite compatible with a "true" approval rating of 32.5%, given the normal randomness in survey results. The last bit here is to look at the red dots in the figure below to see how the estimated trend has been changing over the past 20 polls. With only one exception, it has held between 32% and 33%. That is another reason to think that approval is flattening out now. But I've also used a more sensitive estimator ("ready Red") that catches changes more quickly but is more often fooled by random noise into believing a change has occurred that subsequent polls show didn't happen. I've posted the comparison, and a more extensive comparison of a range of sensitivity estimates here and updated that with each new set of polls. What has become clear is that "old blue" has been too conservative this summer, and has missed an important change in the trend of Rudy Giuliani's support. I want to use this to illustrate what the different estimators reveal and what they smooth out, and to explain a move to a somewhat more sensitive estimator. The current estimates of Giuliani's support are Blue: 27.3%, Red: 28.3% and Black: 27.8%. The estimates are all within one point of each other. In the figure it is clear that the three lines usually overlap each other pretty closely, and so much so in Romney's case that they are all but indistinguishable. The caveat is that the lines can and do disagree with each other when support makes a change of direction. Giuliani's polling has done that at least twice since January. 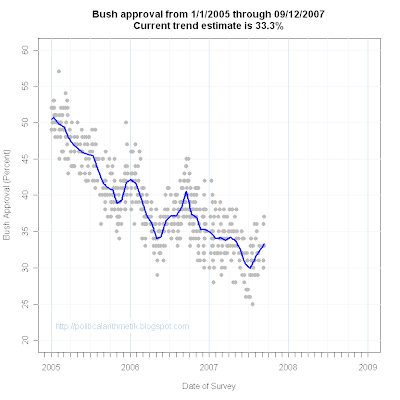 After rising in late 2006 and early 2007, his support peaked late in the first quarter and fell for a while. But the Red and Black estimators agree that the fall was rather sharp and halted by the end of the second quarter after which there has been a mild but noticeable upturn. The more conservative Blue estimator caught the decline but has not shown the subsequent upturn. As a result, it has continued to see a long term decline, rather than a recent stabilization and some improvement. Even though the three estimators currently are within a percentage point of each other in estimating his support, the short term dynamics of the Giuliani campaign are not well represented by the Blue line. The blue estimator was set to be especially conservative in the face of few polls unevenly spaced, as we had in 2006 and the first half of 2007 . As polling has become more frequent over the summer, that extra degree of conservatism became a liability rather than an asset. With enough new polls, a more sensitive estimator can be used. And both Red and Black pick up clear changes in Giuliani's trend. You can see more modest differences for other candidates. 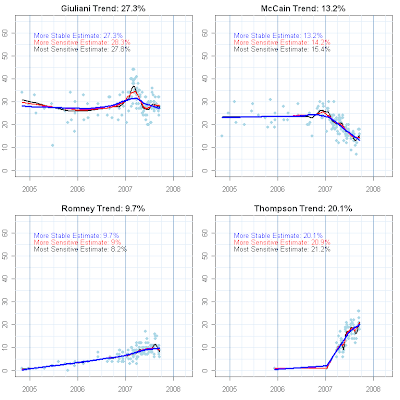 Red and Black think McCain had a modest bump in late 2006 and early 20007, but blue doesn't. And if you focus on the very latest data red sees a flattened trend, black thinks there is a bit of an upturn, and blue still has McCain in decline. This kind of disagreement at the end of the series and based on few polls is common. There isn't enough data to be sure of the trend into the near future. Still, the McCain estimates are currently Blue: 13.2%, Red 14.2% and Black 15.4%, a range of 2.2 points. The Romney trend has been so stable that all three estimators agree almost exactly, except at the very end. The most sensitive Black estimator sees a blip up at about the time of the Iowa straw poll, which is believable, but Red and Blue don't see it. And Black sees a bit of decline since then, which Red barely hints at and Blue doesn't see at all. The bottom line is Blue: 9.7%, Red: 9.0% and Black: 8.2%, a 1.5 point range. The Thompson trends show a bit more short term variability, in part due to fewer polls, but perhaps also reflecting some real short term changes. Both Black and Red see two short term dips in Thompson support (of a couple of points) that Blue smooths out. 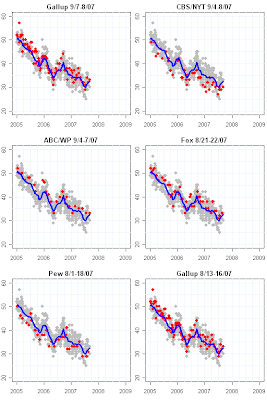 And Blue doesn't detect the post-announcement blip that Red and Black pick up. And the bottom line for Thompson is Blue: 20.1%, Red: 20.9% and Black 21.2%, a range of 1.8 points in the estimates. The Democratic trends have been a bit more stable and so the discrepancies between estimators are generally less. 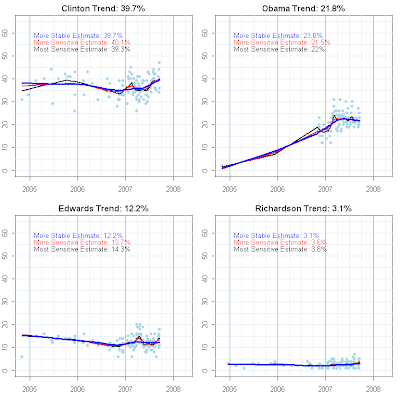 Red and Black see a little more dynamic in Clinton's trends early in 2007 and a small blip or two for Obama. And Red and Black think Edwards was up a couple of points in April while Blue doesn't see it. And Richardson hasn't had enough national movement for there to be any discrepancies. As for the current estimates, Clinton is at Blue: 39.7%, Red: 40.1%, Black: 39.3%, a range of 0.8 points. Obama is at Blue:21.8%, Red: 21.5% and Black 22.0%, a 0.5 point range, and Edwards a bit more variable at Blue: 12.2, Red: 13.7 and Black: 14.3%, a 2.1 point range (and an example of the more sensitive estimators thinking there is a bit of an upturn in Edwards' support. The estimates of current support vary a bit for each candidate, but far less than the variation among recent polls. That is the point of using the estimator, after all--- to remove random variation and get a better estimate of where support stands. The estimates across all the candidates are within 2.2 points of each other at the moment, which I think is pretty good agreement regardless of how sensitive an estimator we use. But the visual pattern of the trend, in Giuliani's case especially, is not well captured by the most conservative "blue" estimator. Now that there is more frequent polling, and therefore less chance that a single poll or two will distort the trend, I think we are safe using a somewhat more sensitive estimator for the trends. We'll be a bit riskier in order to also catch shorter term changes better. As a result of this analysis, we'll be updating our trend plots for the national data to reflect a somewhat more sensitive estimator. However, we won't go too far on that, since we do believe there is a lot of noise in the polls and we want our trend estimates to resist chasing each new poll. The state trends, however, will continue to use the more conservative estimator until enough polling becomes available to allow us to increase the sensitivity. Some states are developing a good bit of data, but even New Hampshire has only 42 Republican polls, while nationally we have 130. And as we've been doing all along, we'll assess sensitivity and write posts on differences between the estimators that may suggest short term changes of interest. Even if we can be fooled by a sensitive estimator, it is always fun to speculate about what it might mean, if there really is a change. A very busy week for pollsters with four new polls today. CNN/ORC was conducted 9/7-9/07, finding 36% approval of President Bush's job performance while 61% disapprove. Harris, done 9/7-10/07 gets 31% approval, 67% disapproval, while AP/Ipsos from 9/10-12/07 puts approval at 33% and disapproval at 64%. The latest is the Fox poll taken 9/11-12/07 which finds approval at 37% and disapproval at 58%. The addition of these four polls raises the trend estimate of approval to 33.3%. This is the first time since May 9 that approval has reached the one-third point. The new polls are nicely balanced around the current estimate: Fox and CNN are about as far above the trend as Harris and AP are below it. You can get a sense of the house effects of each of these pollsters from the chart below. 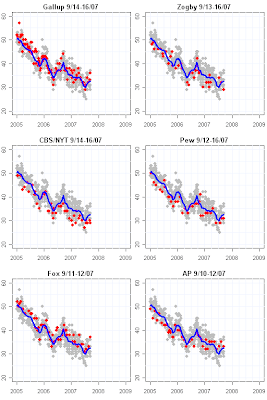 The balance of polls above and below trend is also evident in the residuals plot below. No recent poll is close to being an outlier. All of the last 10 polls lie within the normal range of sampling variation. August was a slow month for polling generally, but we've had a nice new surge of September polling, including Presidential approval. The three new polls are ABC/WP taken 9/4-7/07 which finds approval at 33%, disapproval at 64%, CBS/NYT done 9/4-8/07 with approval at 30%, disapproval at 64% and Gallup/USAToday from 9/7-8/07 getting approval at 33% and disapproval at 62%. A nicely consistent bunching of results. 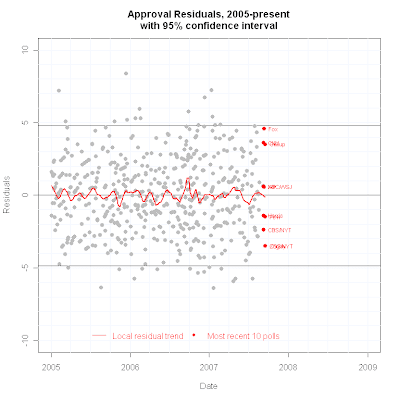 No recent polls are close to outlier status. This is the week for a review of opinion of the war. There are three questions that have been asked consistently throughout the war. "Do you approve or disapprove of the way George W. Bush is handling the situation in Iraq?" "All in all, do you think it was worth going to war in Iraq, or not?" The long run story these question tell is of decreasing support for the war, from quite strong support initially to low levels today. There is differentiation, however, across these elements. 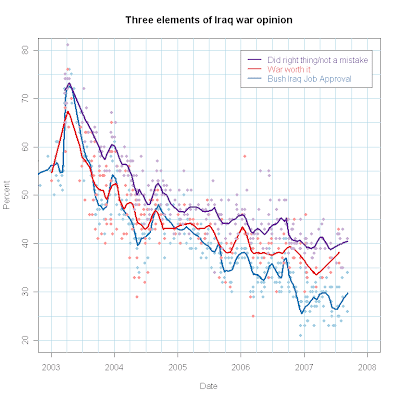 President Bush's handling of the war has consistently been rated lower than the other two after the initial 6 months of the war. Americans have become dubious of the costs and benefits of the war as well, with less than 40% thinking it worth the cost since early 2006. But the public has somewhat more trouble believing the war was not the right thing to do. Over 40% continue to think the US did the right thing, even if the costs have outweighed the benefits and the President's handling of the war has been poor. Flipped, these data show solid majorities believing the war was a mistake, that it has not been worth it and that the President's handling of it has been unimpressive. So why doesn't public opinion force an immediate end to the war? One reason is because the public is more equivocal as to motivation than to performance, and more equivocal still as to solutions. A referendum on Bush's performance would lead to overwhelming rejection. But a vote on whether the war was fundamentally wrong in the first place finds a substantial minority still supports the war. A Democratic advantage, but not an overwhelming one. Combining the first two, this is a 30%-35%-30% split. The "swing vote" here is what do the 35% mean when they say "decrease"? Do they have something like General Petraeus presented today, with a draw-down to pre-surge levels by July 2008? Or do they prefer a much more dramatic reduction, and by an earlier deadline? It is this 35% of the population that could produce overwhelming pressure for a large reduction if they turned out to be united with the "remove all troops" group. But if not, they provide a crucial buffer of opinion for the administration and Republican allies. Would you say the troop increase is making the situation in Iraq better, making it worse or is it having no impact? While a lot see no impact (and may favor a troop reduction in any case) the 35% seeing improvement is quite striking as a basis for support of the surge. Take some share of the 45% that don't think it has mattered much but who aren't opposed to continuing the surge, and again we have a substantial reservoir of support for current policy, and more importantly we lack an overwhelming consensus in favor of a reversal of current policy. Absent that kind of irresistible opinion force, Republicans in Congress can continue to support the President. Bottom line: Frustrated anti-war forces are understandably angry that the 2006 election victory and subsequent Democratic Congress has failed to bring change to Iraq policy. The trend lines above show how support for the war has declined dramatically since 2003. Anti-war forces can correctly point to substantial majorities who are critical of various aspects of the war. But change in Congress also requires that Republican members perceive that opinion against the war is so overwhelming that it is time for them to also abandon ship. That mark in public opinion has not been reached. So long as a substantial minority (say 40%+) support the current policy (or at least oppose a rapid withdrawal) then Republicans can count on a public that is too divided on the issue to pose the certainty of electoral catastrophe. This isn't to say Republicans don't wish the issue would go away, or that they relish running in 2008 with nearly 6 years of inconclusive war on their watch. But opponents of the war will not prevail in Congress unless a more massive opposition emerges--- and one united on the specific details of how to end the war.